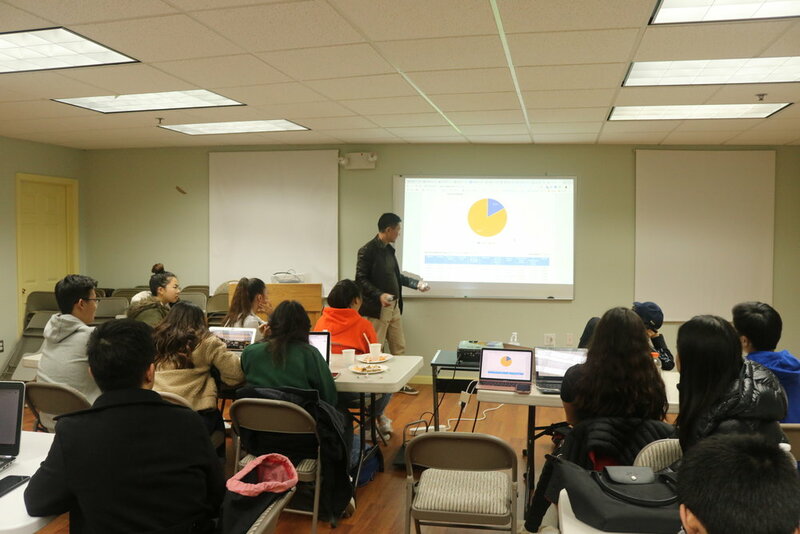 This session we took time to look through how the students were doing with their stock market game with June Woo, a financial advisor at Edward Jones Investment. He went through each groups portfolio and help the students analyze the how they were shaping their portfolios and gave advice as to how to build on from there. He also explained to the students of the different types of portfolios that could be built and how each could be affected. He also listened to how the groups came to the decision of buying certain stocks and shared his opinion and knowledge to the students. The student found having info session and going through each portfolio was very helpful. 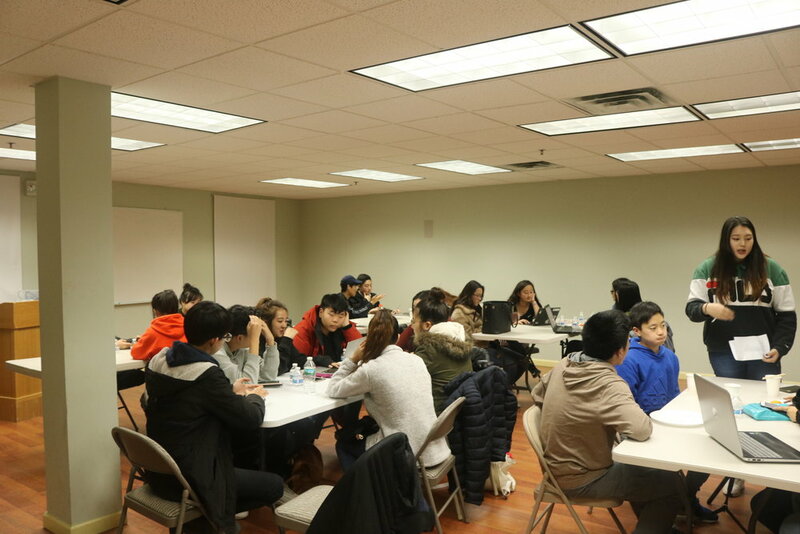 Afterward, the students divided into their community group projects to finalize their proposals for this year’s community change projects focused on majored social issues. This year we have five groups. The topics this year are on educational disparity, climate change, water and food security, violence, and discrimination. Each group has submitted a proposal as to what they will do in order to mitigate such problems. The students researched and gathered ideas to understand and find ways so they can work in this community to create awareness and allay the issue. The students feel having this group project will be useful in the future, and although it may be difficult, working together to solve and make a change, we believe it will be a valuable lesson for the students. Lastly, we held a small holiday party for the students to enjoy as they get ready for their winter break. The students had a blast playing white elephant (a gift exchange game). Some gifts that were a hit among the students were a Bluetooth speaker, mood light, and a BTS featured facial masks. Along with the gift exchange, the students had a chance to show off their Christmas knowledge in our trivia game. 저번주 토요일 12/15 에 투자금융 회자, Edward Jones Investments 에서 근무하시는 Mr. June Woo님 께서 오셔서 기본적인 주식에대한 설명과 Stock market game을 살펴보는 시간을 가졌습니다. Mr. Woo 께서는 각 그룹 주식의 포트폴리오를 살펴보고, 구성하는 방법을 분석하도록 도와주시며, 발전을 할수 있는 방향에 대해 학생들에게 조언을 해주었습니다. 또한, 다양한 종류의 포트폴리오와 각 어떻게 영향을 받을 수 있는지를 설명을 하고, 그룹들이(학생들의 팀) 어떻게 특정한 주식을 사기로 결정하게 되었는지에 대해서도 듣고, 그의 의견과 지식을 학생들에게 공유해주었습니다. 학생들은 각 그룹별로 포트폴리오를 분석했던 시간이 많이 도움이 됬다고 설문에 응해줬습니다. 첫번째 수업이 끝난후, 학생들은 교육 격차, 기후 변화, 물 과 식량 안보 그리고 폭력, 및 차별에 관련된 요즘사회의 핫한 이슈를 찾아 사회 변화를 목적으로 둔 프로젝트를 5개의 그룹으로 나뉘어 토론을 했습니다. 각 그룹은 이러한 문제를 완화제안을 제출하였으며, 문제에대한 이해와 방법을 위해 조사하고 수집하며 이 사회에서 그 문제들의 인지도를 높이고 문제를 완화하기 위해 일할 수 있는 방법을 찾고있습니다. 학생들 설문조사 한 결과 많은 학생들은 사회 변화 프로젝트로 인해 미래에 도움이 될것이라고 생각하며, 힘들어도 그룹협동으로 인해 많은 배움이 있다고 생각합니다. 마지막으로, 우리는 학생들이 겨울방학 준비를 하면서 즐길 수 있는 Holiday Party를 열었습니다. 학생들은 White Elephant (선물 교환 게임) 을 하면서 즐거운 시간을 보냈습니다. 학생들 사이에서 제일 인기 많은 선물 중에는 블루투스 스피커, 무드 라이트, 과 방탄소년단 주연한 페이스 마스크 있었습니다. 선물 교환과 함께, 학생들은 트라이비아 게임에서 그들의 크리스마스 지식을 보여줄 기회를 가졌습니다.